Gen'l Ross is of course Hulk's perennial nemesis. Simple publication date puts his appearance and Sub-Mariner's both between the relevant stories in Tales to Astonish #91 and #92. Captain America allied with the Red Skull to save New York in Tales of Suspense #90. Skull had the Cosmic Cube in ToS#80-81, but it was lost in the ocean. Cap is obviously worried in case he gets hold of it again. Namor here displays the ability to detect radio waves. He has a history of exhibiting such one-off strange powers. E.g. in the Human Torch story in Strange Tales #107 he swelled himself up like a puffer fish. And in his fight with the original Human Torch in Timely's Marvel Mystery Comics #8 Subby could spray water from his body to douse flames. Namor has had telepathic control of fish before this. But how does he tell them what to look for? The only thing he knows about the Cosmic Cube is its name! Presumably the chain holding the Cube round Sub-Mariner's neck wasn't part of the Cube, just one of its creations. Otherwise I wouldn't think Jan could break it. Mole Man made his first appearance at the very start of modern Marvel in Fantastic Four #1. But he's not proud, he'll fight anybody. Currently between bouts with the Hulk in TtA#80-81 and (according to the Official Index) Iron Man in ToS#87-88. This is of course not the last we'll see of the Cosmic Cube. It will turn out that it's not the only Cosmic Cube in the universe. And they can become sentient, which this one will in CA Annual #7, taking on the name Kubic in Av#289. Next issue John Buscema takes over as penciller, but Don Heck will be back for the 1st Annual. The 5 Avengers (excluding the absent Captain America) and their guest Hercules are clearing up the damage caused last issue when the Mad Thinker and his minions tried to steal Avengers' equipment. Scarlet Witch's hex was overloaded in the battle, and she now collapses in delayed reaction. Black Widow stole plans for an atomic submarine last issue, and she now nicks an experimental plane from Gen'l Ross's base in order to get the plans to Communist China. No-one, even her lover Hawkeye, knows this is all part of her secret mission for SHIELD. The Sub-Mariner stops a US submarine testing new torpedos near Atlantis. When the sub attacks him he lures it into a natural trap. The sub radios for help, and Subby follows the radio waves to a Naval base on Puerto Nuevo island. Meanwhile back at Avengers Mansion our heroes have just seen on TV Cap pledge allegiance to the Red Skull (in Cap's half of Tales of Suspense #90). Then they get a call from Cap, who has sneaked away from the Skull to ask them to find the Cosmic Cube. Quicksilver stays to look after Wanda, but Hercules accompanies Goliath, Hawkeye and Wasp. 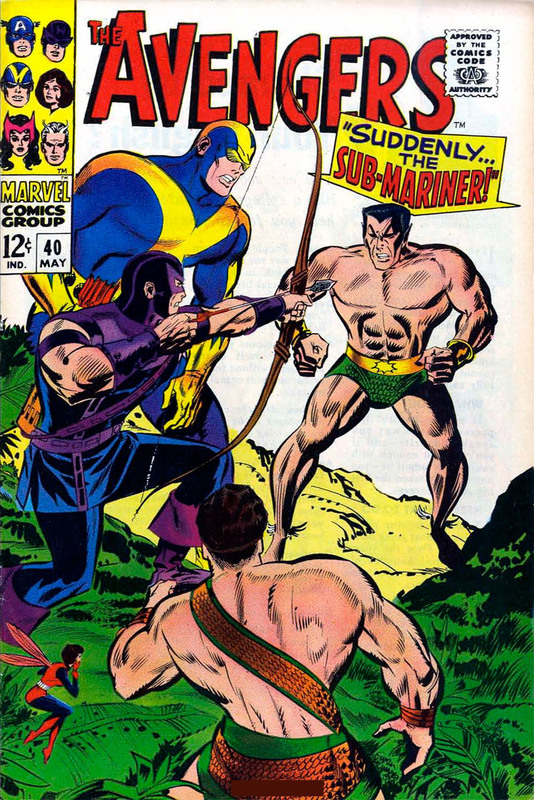 The last known position of the Cube was of course near Puerto Nuevo, where Namor is fighting his way through guards trying to get to the commanding officer to order him to keep his submarines away from Atlantis. Miniature Hank and Jan fly down from the Avengers' aero-car under Wasp's wing-power, to tackle Subby while Hawkeye lands the plane. The ensuing melee is only ended when Hercules throws Sub-Mariner (weakened away from water) into the sea. Unfortunately during the fight Hercules accused Namor of seeking the Cosmic Cube. Subby didn't know anything about this, but now mentally tells the denizens of the deep to find it for him. And they do. Namor discovers that the Cube obeys his every command. He reshapes it to a pendant and hangs it on a chain round his neck, and returns to the island for a rematch with Hercules. He creates a creature that is a giant amalgamation of several others to keep Goliath and Hawkeye busy while he conjures up a water-filled fissure to fight Hercules in. Wasp follows the equally-matched pair, and realises that Sub-Mariner's pendant must be the Cosmic Cube. She snaps the chain with her sting. Immediately the amalga-beast and the water disappear (but not the equally-Cube-created fissure). The Cube falls down the fissure. Namor beats a strategic retreat. Now the fissure closes up, and the Avengers are satisfied that the Cube is out of anybody's reach. But beneath their feet it is found by Mole-Man. Who tosses it away as a useless trinket.